IBM helps organizations protect their business-critical data and infrastructures—and the people who use them—from threats and breaches. The integrated IBM approach to security is based on a broad portfolio of security solutions that enable a comprehensive view of all network user activity, including abnormal behavior. 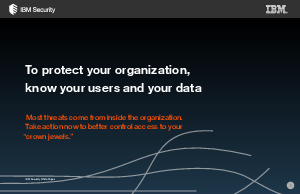 An intelligent, adaptive approach to security and the ability to share findings and results enable IBM solutions to help stop insider threats aggressively with targeted actions.